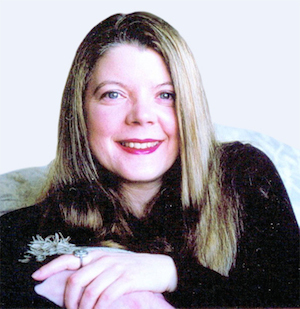 In my Camelot Reborn series, King Arthur and the Knights of the Round Table are transplanted to present-day Washington State where they battle to save us from marauding fae. First and foremost, the stories abound with intense romance, but there is also plenty of action, monsters, and a medieval theme park. And food! 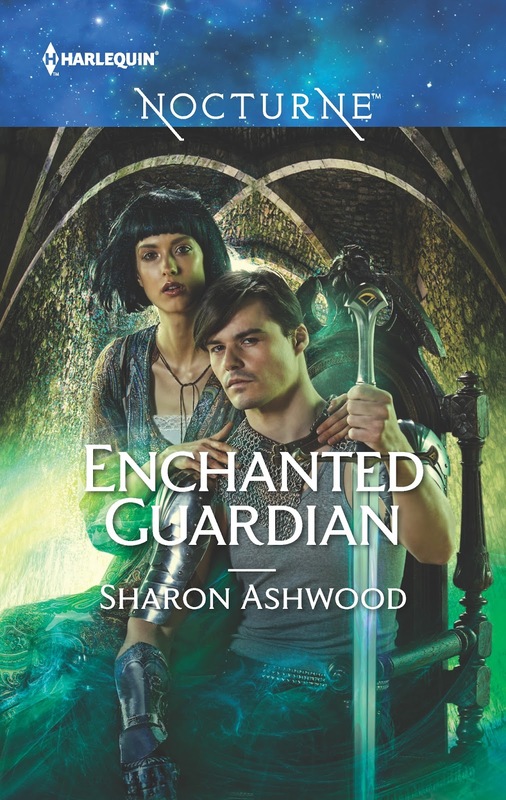 In Enchanted Guardian, there is a medieval feast. Who doesn’t like smoking hot heroes and smoking hot cuisine? Historical cooking is one of my hobbies, so I have a good collection of medieval and renaissance recipes. However, when I first started looking into the subject I had very little to go on besides the fact that Robin Hood hunted deer and King Henry ate a lot of chicken, at least in classic movies. As I did more research, I learned the medieval cook did indeed prepare venison and poultry—and whatever else they could catch. If it flew, swam, or ran there is probably a recipe for it. Peacocks roasted and re-dressed in their feathers seem to have been popular. 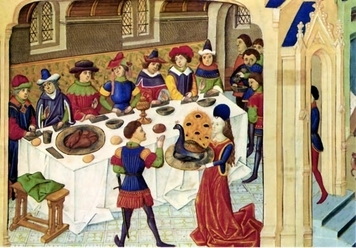 Depending on time, place, and budget, medieval feasts could get very fancy indeed. These extravaganzas were a show of power and wealth, so ingenuity and spectacle were important. There were many courses interspersed with entertainment, so the meal would start during the day and go on for hours. As for the food itself, while everything was largely seasonal, the flavors could be quite sophisticated. Crusaders who had experienced exotic cuisines in their far-flung travels wanted to enjoy the same treats at home, and increased trade with the East meant cardamom, cinnamon and other spices were available at a cost. The showpiece of the meal would be a “subtlety,” which was usually a dish made to look like something it was not—such as an elaborate gingerbread castle decorated in gold leaf. Modern recreations of old feasts range in authenticity. 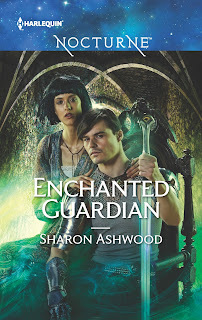 Years ago, I went to one at Hatfield Castle that was definitely adapted to modern palates, and the one I describe in Enchanted Guardian is similarly updated. However, if you want to see a medieval feast brought to life, I recommend the show Heston’s Medieval Feast on YouTube https://youtu.be/TEDnz4vCzAE, in which the chef recreates some of medieval cookery’s greatest hits, including four and twenty blackbirds (still alive) in a pie. In another time, in a place once known as Camelot, they had been lovers. Torn apart by betrayal and lies, Lancelot Du Lac and Nimueh, the Lady of the Lake, had each suffered greatly. But the magic of the fae had reawakened a man once trapped in stone, and Lancelot was determined to find his long lost love. Only, Nim was desperate to hide her fae soul, as she was marked for death by their mutual enemy. Though centuries apart had not diminished their passion, they would once again face a dangerous test to prove each was the other’s destiny. Lancelot caught her arm, pulling her up short. Nim scowled down at the long, strong fingers. Fine scars ran along his tanned knuckles, evidence of a life around blades. Heaviness filled her, a primitive reaction to the strong, aggressive male taking control of her in the most basic way. Once it might have grown into anger or lust, but now it confused her. “Take your hand off me,” she said, letting her voice fill with frost. His nostrils flared as if scenting her. Still, Nim studied his tense jaw and the blood flushing his high cheekbones. The heat of his emotions made her feel utterly hollow. His hand closed around her wrist again, almost crushing her bones. “There are too many people here,” he growled. Just not against what he’d done to her heart. She closed her eyes a moment, feeling his breath against her cheek and remembering the past for a long moment before she denied herself that luxury. “Let me go,” she repeated. He had both of her arms now, prisoning Nim with the hard, muscled wall of his chest. Anyone walking by might glimpse two lovers in a private tête-à-tête, but Nim drew back as far as she could, something close to anger rising to strike. No one handled her this way, especially not him. “Then talk,” she said through gritted teeth. “Aren’t you even surprised to see me?” he demanded. “Why should I be?” She needed to squash any personal connection between them. Even if she was whole and their people were not at war, he had betrayed her. He put a hand against her cheek, his fingers rough. She jerked her chin away, burning where his touch had grazed her. His expression was stricken as if hearing it from her lips was poison. Good, she thought. Better to be honest. Better that he believe her to be the monster she was. With that, he claimed her mouth in an angry kiss. Nim caught her breath, stifling a cry of true surprise. The Lancelot she’d known had been gentle and eager to please. Nothing like this. And yet the clean taste of him was everything she remembered. Still, that little encouragement was all the permission he needed to slide his hand up her hip to her waist and she could feel the pressure of his fingers. Lancelot was as strong as any fae male, strong enough certainly to overpower her. That had thrilled her once, a guilty admission she’d never dared to make. She’d been so wise, so scholarly, so magical, but an earthy male had found the liquid center of heat buried under all that logic and light. They had always sparked like that, flint against steel. But then his hand found her breast and every muscle in her stiffened. This was too much. Memory was one thing, but she wasn’t the same now and she refused to have a physical encounter that was nothing more than a ghost of what it should be. Sounds like a really good story. I may have to put it on my ever growing TBR pile. Thanks for the chance to win a cool prize. This looks like a good series and I enjoyed the post.